In Fine Art > Mid-Century Art > Show & Tell and Posters and Prints > Prints > Show & Tell. Here's another rare, signed Charley Harper silk screen/serigraph hanging up in my dining room. This cardinal portrait is probably one of the most popular prints from the era. Circa 1950's. 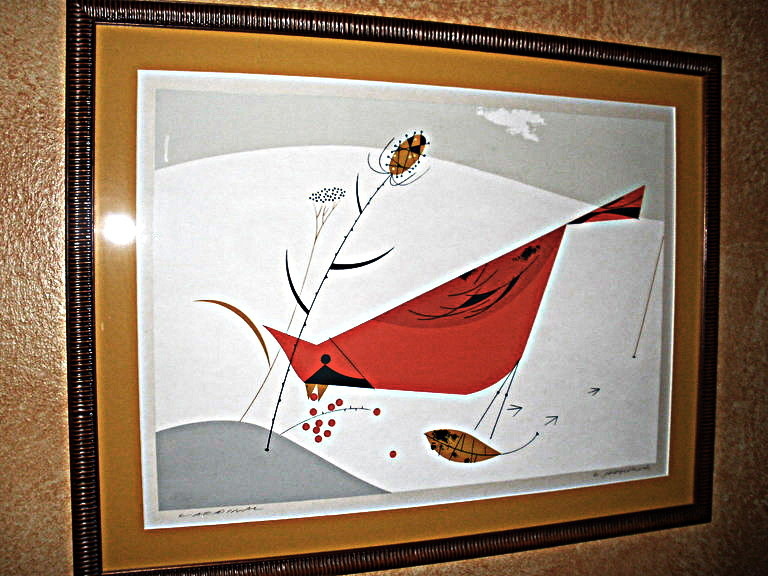 He did some later cardinal prints in the 1970's, but this mid-century modern one is my favorite. During the period of late 1948 through mid-1982, Charley Harper contributed hundreds of illustrations to the Ford Times magazine, produced by the Ford Motor Company. He is now deceased. He did a number of bird prints. Circa 1950's. I framed it with a retro, tiki-style, bamboo frame. Charley Harper used a style called "minimal realism," and this portrait has all the elements of the atomic age with bold colors and geometric designs. I started collecting these portraits several years ago before recent interior designer, Todd Oldham, made him popular again. Some of Charles Harper's graphic designs have even been featured on "The Antiques Roadshow. "